"The devices’ portrait features include precise 3D facial detection technology, dynamic illumination and portrait enhancements. A smart imaging algorithm applies studio-like re-lighting and beautifying effects to create radiant portraits. Using the new depth-of-field algorithm, a natural bokeh effect creates sharper, clearer and more vivid colors in the foreground, while the background remains elegantly blurred. 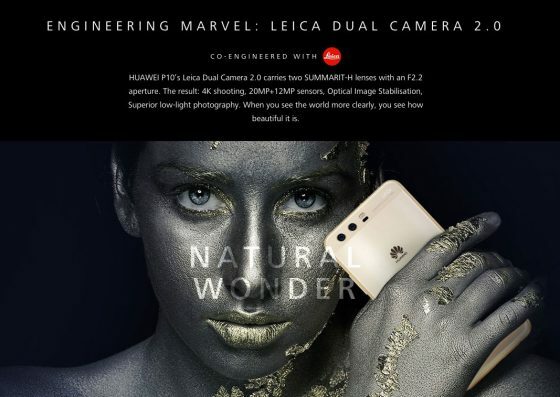 The Huawei P10 Plus’ Leica Dual-Camera 2.0 Pro Edition includes new SUMMILUX-H Leica lenses with a larger F/1.8 aperture and higher optical capability. Co-developed with GoPro, the Huawei P10 and Huawei P10 Plus also feature Highlights, a mobile editing tool which creates a dynamic video of users’ images and videos." Kirin 960 processor, Huawei Ultra Memory and new EMUI 5.1. Can the Huawei P10's 'Leica-style' portraits beat the iPhone 7 Plus? Check Huawei P10 pricing and availability in the US. This entry was posted in Other Leica Stuff and tagged Huawei / Leica smartphone, Huawei P10. Bookmark the permalink. Trackbacks are closed, but you can post a comment.